The Bauhaus Art Movement, begun in 1919 in Weimer, Germany, was an offshoot of the Bauhaus School founded by architect Walter Gropius. It continued to gain in influence even after the school was closed in 1933. The Bauhaus School sought to reconcile both fine arts and applied arts in its curriculum, offering training in architecture, arts and typography, as well as graphic, interior and industrial design. Dozens of well-known artists came to The Bauhaus as guest lecturers and some of the more famous instructors on staff included Wassily Kandinsky, Joseph Albers and Paul Klee. All three artists left Germany when the Nazis forced closure of the school. Bauhaus artists, designers and architects, however, continued to exert great influence in their fields long after. You'll find a large selection of Bauhaus artwork here at AffordableArt101. This includes Bauhaus prints, Bauhaus lithographs and Bauhaus silkscreens. 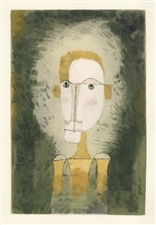 Paul Klee pochoir "Portrait in Yellow"
Medium: offset lithograph with pochoir hand-coloring. Published in Milan in 1958 by Silvana Editoriale d'Arte in an edition of 200. The image measures 11 x 7 1/4 inches (280 x 185 mm) with good margins. Signed in the plate, not by hand. Very scarce. Medium: offset lithograph with pochoir hand-coloring. Published in Milan in 1958 by Silvana Editoriale d'Arte in an edition of 200. The image measures 10 1/2 x 8 1/4 inches (267 x 210 mm) with good margins. Not signed. Very scarce. Condition: there is minor color offsetting -- this particular Albers silkscreen was for many years pressed against another silkscreen inside the portfolio, resulting in a bit of pigment rubbing off from one to the other. 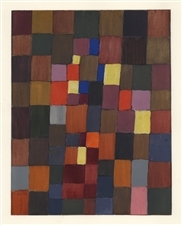 Paul Klee pochoir "The Way we Play"
Medium: offset lithograph with pochoir hand-coloring. Published in Milan in 1958 by Silvana Editoriale d'Arte in an edition of 200. The image measures 8 1/2 x 11 inches (215 x 280mm) with good margins. Not signed. Very scarce. Paul Klee pochoir "Liberation of the Soul (Abandon)"
Medium: offset lithograph with pochoir hand-coloring. Published in Milan in 1958 by Silvana Editoriale d'Arte in an edition of 200. The image measures 11 x 6 3/4 inches (280 x 173mm) with good margins. Not signed. Very scarce. Medium: offset lithograph with pochoir hand-coloring. Published in Milan in 1958 by Silvana Editoriale d'Arte in an edition of 200. The image measures 11 x 7 inches (280 x 175mm) with good margins. Not signed. Very scarce. 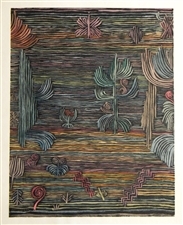 Paul Klee pochoir "Insula Dulcamara"
Medium: offset lithograph with pochoir hand-coloring. Published in Milan in 1958 by Silvana Editoriale d'Arte in an edition of 200. The image measures 5 1/2 x 11 inches (140 x 277mm) with good margins. Not signed. Very scarce. Medium: offset lithograph with pochoir hand-coloring. Published in Milan in 1958 by Silvana Editoriale d'Arte in an edition of 200. The image measures 8 1/4 x 11 inches (210 x 280mm) with good margins. Signed in the plate, not by hand. Very scarce.